Vingt ans après son film de fin d’études à UCLA (Usa) Shot Down, censuré dans son propre pays tout voyageant dans des festivals où il est applaudi et acquiert un statut de film culte, le scénariste-réalisateur sud-africain Andrew Worsdale revient avec sa romance noire qui se déroule dans le milieu marginalisé des Blancs défavorisés. Le film suit l’enquête de police autour de quatre meurtres et rend compte de l’amour tragique des assassins amoureux. Twenty seven years after his UCLA graduate thesis film Shot Down was banned in his home country and went on to festival acclaim and cult status, writer-director Andrew Worsdale returns with this noir romance set among the marginalised white underclass. The film follows a police investigation into four murders and charts the doomed romance of the outlaw lovers. A deeply romantic, elegiac and universal crime story where the murders are not the point of the movie. By the end of the film you have become complicit witnesses of a powerful, combustible romance and their times together should stay in your mind long after you leave the cinema. wenty seven years after his controversial UCLA thesis film « Shot Down » was banned in his home country and went on to festival acclaim becoming’South Africa’s definitive cult film of the 1980s’, writer/director ANDREW WORSDALE returns with this noir romance set amongst the marginalised white underclass. Inspired by a true story, this is a road movie that follows a police investigation into four murders and charts the doomed romance of outlaw lovers. 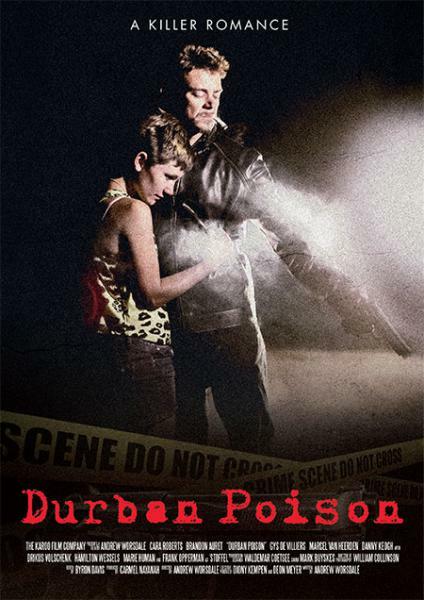 « DURBAN POISON » features an impressive range of South African acting talent and stars BRANDON AURET, CARA ROBERTS (in her feature film debut), GYS DE VILLIERS, MARCEL VAN HEERDEN, DANNY KEOGH, DRIKUS VOLSCHENK, RONNIE NYAKALE, MARIE HUMAN, HAMILTON WESSELS and FRANK OPPERMAN as Stoffel.